Both human and nonhuman primates preferentially orient toward other individuals and follow gaze in controlled environments. Precisely where any animal looks during natural behavior, however, remains unknown. We used a novel telemetric gaze-tracking system to record orienting behavior of ringtailed lemurs (Lemur catta) interacting with a naturalistic environment. We here provide the first evidence that ringtailed lemurs, group-living prosimian primates, preferentially gaze towards other individuals and, moreover, follow other lemurs’ gaze while freely moving and interacting in naturalistic social and ecological environments. Our results support the hypothesis that stem primates were capable of orienting toward and following the attention of other individuals. Such abilities may have enabled the evolution of more complex social behavior and cognition, including theory of mind and language, which require spontaneous attention sharing. 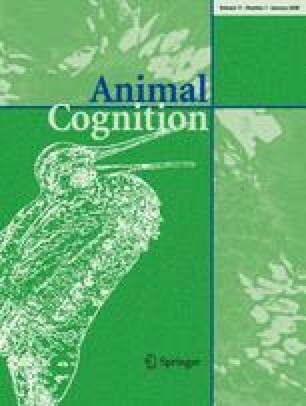 This is the first study to use telemetric eye-tracking to quantitatively monitor gaze in any nonhuman animal during locomotion, feeding, and social interaction. Moreover, this is the first demonstration of gaze following by a prosimian primate and the first to report gaze following during spontaneous interaction in naturalistic social environments. The online version of this article (doi: 10.1007/s10071-007-0083-6) contains supplementary material, which is available to authorized users. Thanks to Kyndal Davis, Luke Stewart, Lauren Whitted, Dan Schmitt, Julie Ives, Stephanie Combes, Bill Hess, David Haring, Ben Hayden, and Chris Kirk. Lemur body silhouette in Fig. 5 adapted, with permission, from a photo by June Rubis. Supported by the Alfred P. Sloan Foundation and the Duke Lemur Center (DLC #1016).